A hilarious and well-crafted memoir of music and excess from the PR legend who accidentally invented Britpop. Phill Savidge is widely credited as being the main instigator of the Britpop music movement that swept the UK in the mid-1990s. Savidge was co-founder and head of legendary public relations company Savage & Best, the company that represented most of the artists associated with the scene, including Suede, Pulp, The Verve, Elastica, Kula Shaker, Spiritualized, Menswear, The Auteurs, and Black Box Recorder. Phill suggests that Britpop came about ‘by accident’ because he refused to represent any American bands. He subsequently ended up with an extremely accessible, media-friendly roster that lived around the corner and included the most exciting press-worthy acts of the era. His unique experience at the epicentre of Britpop led to many intimate, not entirely self-congratulatory encounters with a who’s who of popular culture—including Brett Anderson, Damon Albarn, Roy Orbison, David Bowie, Joe Strummer, Lou Reed, Michael Barrymore, Richard Ashcroft, Andrew Lloyd Webber, Mick Jagger, George Lucas, Damien Hirst, and Dave Stewart, among others. But did he really Sellotape a cassette of Suede’s ‘Animal Nitrate’ single to a purple velvet cushion—with a note that said ‘another great disappointment’—and then bike it to the NME? And could he and Jarvis Cocker really have fallen out simply because a journalist thought he was more glamorous than the Pulp front man? If you’ve ever wondered what it’s like to represent Hirst, Cocker, and The Verve in the same decade, and then wake up in bed with Keith Allen in the Ritz in Paris—courtesy of Mohammed Al Fayed—then you should read this book. 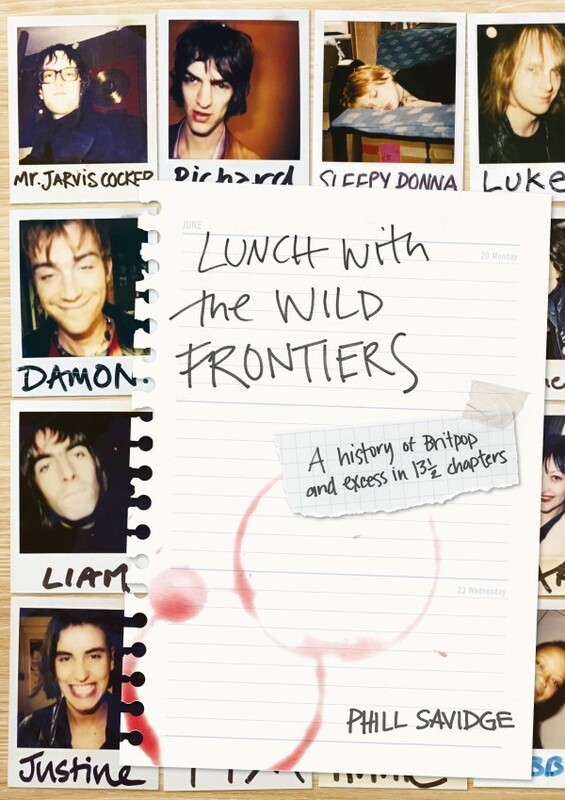 Imagine David Sedaris with a hangover and an expense account and you’re halfway to appreciating the delinquent delights of Lunch With The Wild Frontiers. Phill Savidge is a writer and publicist best known for being at the epicentre of the Britpop movement that exploded during the 1990s. During this vibrant and exciting period in British music history, Phill and his company, Savage & Best—who represented Suede, Pulp, The Verve, Elastica, and almost every band associated with Britpop—had the kind of fun that is now banned by the Proper Job Authorities.